Everything was new for the Wyoming football team last year with a new coach, new schemes, etc., one of the newest positions continues to be a work in progress — fullback. UW returns all of its fullbacks that were on the roster last season, including the two that played in sophomore Drew Van Maanen and junior Jordan Ellis. Others who return include redshirt freshmen Wade Cicierski and Matt List. The fullback isn’t asked to carry the ball much — if at all — for UW. Ellis was the only guy that did, and had just one carry for five yards. Blocking is the top priority for this group, although Van Maanen and Ellis caught two passes apiece last season. 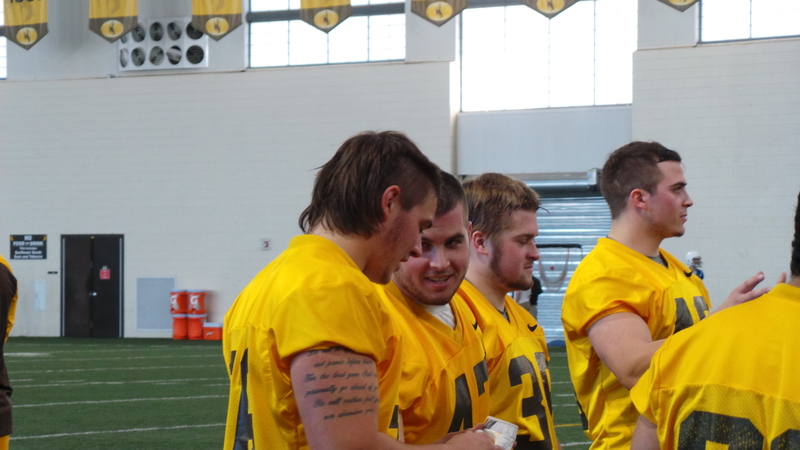 Drew VanMaanen sporting quite the haircut during spring drills. Photo by Robert Gagliardi/WyoSports. 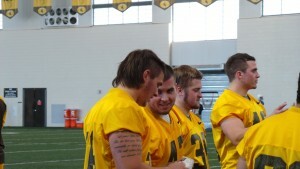 Van Maanen also is rocking one of the better haircuts on the team with the mullet and a fade on both sides. Ellis, Cicierski and List are going through their first spring drills for UW, so that added practice time and film work should help their progress. For more on arguably UW’s strongest position on the team — running back — see Saturday’s Wyoming Tribune Eagle and Laramie Boomerang, and log on to wyosports.net. The story mentions the four running backs on the roster this spring for the Cowboys — senior Shaun Wick, sophomores Brian Hill and Josh Tapscott and redshirt freshman Nico Evans. Before Friday’s practice, the two posed for a picture after watching me take a few. 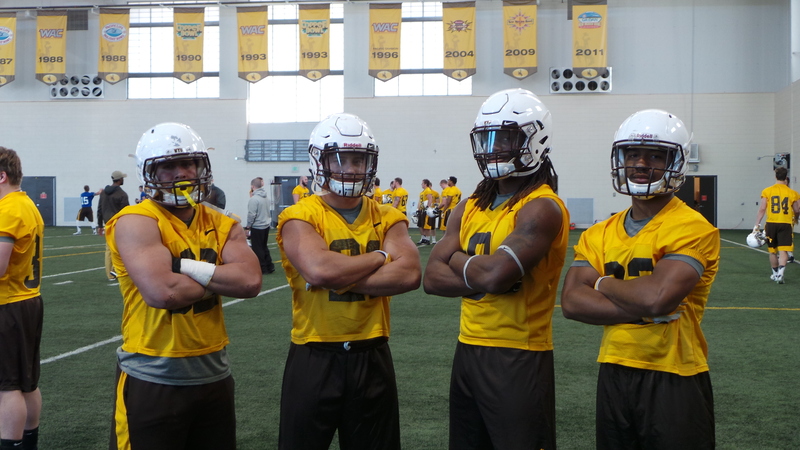 From left to right, Josh Tapscott, Shaun Wick, Brian Hill and Nico Evans have some fun posing for a picture prior to Friday’s spring practice in Laramie. Photo by Robert Gagliardi/WyoSports. –Junior Eric Nzeocha, who was moved from tight end to linebacker this season, got some work in at middle linebacker during some walk-throughs early in practice. Former receiver Trent Sewell also moved to linebacker this spring and is working at one of the two outside spots. –With senior center Rafe Kiely limited this spring due to injury, sophomore Charlie Renfree and redshirt freshman Cole Turner are getting reps at center this spring. –Speaking of some interesting haircuts, sophomore tackle Taylor Knestis is rocking the bald look with the full beard. Not everyone call pull that look off, but Knestis does it justice. 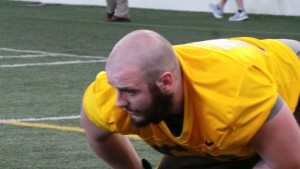 Taylor Knesits rocking the bald head and full beard. Photo by Robert Gagliardi/Wyosports. –UW is hosting a coaching clinic this weekend, and director of football operations Brent Vernon said around 60 high school coaches from around the region will speak and take part in clinics through Saturday. Several high school head coaches were at Friday’s practice, including Laramie’s Chuck Syverson, Cheyenne South’s Tracy Pugh and Sheridan’s Don Julian — a former UW assistant from 2002-06. Here are some highlights from the early portions of UW’s second practice of spring drills on Friday, along with UW coach Craig Bohl after practice. This entry was posted in Football and tagged Brent Vernon, Charlie Renfree, Chuck Syverson, Cole Turner, Don Julian, Drew Van Maanen, Eric Nzeocha, Jordan Ellis, Matt List, Mike Bath, Rafe Kiely, Tracy Pugh, Trent Sewell, Wade Cicierski, Wyoming Cowboys, Wyoming Football, Wyoming Spring Football 2015 by Robert Gagliardi. Bookmark the permalink.